Welcome to Cedar Bluffs, Nebraska! On a rainy morning on July 26, 1886 near an old corn crib in northern Saunders County, a group of spectators stood around a wagon while potential buyers stood in all kinds of shade from the rain storm. Agent Whitney, from the Townsite Co., auctioned off individual lots to the eager buyers who claimed ownership now known as the various businesses and buildings on Main Street. Within days newly framed businesses sprung up on the new Main Street that still exists today. This new town of Cedar Bluffs was the only link between Fremont and Wahoo. Previously, it had been a great hardship for the early settlers living in the northern part of Saunders County to reach a market with their products. Crossing the Platte River sometimes proved treacherous, transporting their goods across the river. In 1853 the Pawnee Indians were reported to have operated a floating barge, large enough to hold a wagon and team. The Indians charged the immigrants to cross the river, providing transportation. Some of the new businesses for Cedar Bluffs consisted of a drug store, butcher shop, barber shop, hardware store, saloons, pool hall, harness shops, furniture store, dressmaker shop, mortuary, necktie factory, photography studio, general store, 3 grocery stores, a bank, a hotel, bakery, several doctor’s offices, and an Opera House which was the scene of many local events, such as local plays, dances, Chautauqua programs and medicine shows. The early Chicago, Northwestern Railroad Company was built in late summer of 1886. It connected Fremont to Lincoln hauling lumber, coal and passengers while grain and livestock were hauled out of town. Along the new railroad you would find a lumberyard, coal yards, and livery stables. As the years went by, new businesses were added to the community as well as the Farmers Co-op Elevator, the CB Public School System, Fire Department, several churches, electricity and improved public roads. On September 1, 1981 the last train pulled through Cedar Bluffs. Today the village has a population of approximately 620 residents with an agriculture base for its citizens as a source of income. The village is managed by a 5 member board which includes the Village Chairman. 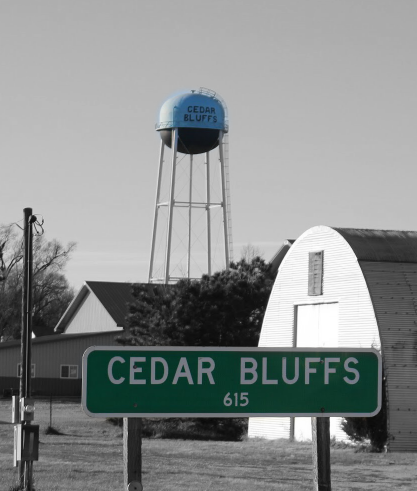 The origin of the name of Cedar Bluffs has had many versions. The site was originally part of the Pohocco precinct. “Pahuk” meaning: Holy Hill and “Pohoc” meaning: very bluffy. For more information please visit our website by clicking on the link attached to this page!